Next Gen Dine restaurant point of sale by Prelag Partners LLC is now available for download on the Apple App Store. Prelag Partners LLC launched a new restaurant point of sale application on the App Store, Next Gen Dine. This point of sale will soon be available on the Android Market. Prelag Partners LLC meticulously created the Next Gen Dine point of sale with all aspects of running a restaurant in mind. The point of sale is designed to cater to all needs of a restaurant. The point of sale system allows for orders to be taken table-side inside or outside on the patio of the establishment. This is perfect for restaurants that want to offer top of the line customer services. All orders placed are immediately sent to the kitchen to the appropriate prep station, which reduces the order turnaround time. Hostesses can also make reservations on Next Gen Dine. Once a reservation is made, a confirmation text will be sent out to the patron. Once the reservation is complete, the hostess can send a text to the patron to let them know that their table is ready. This proves especially efficient for busy restaurants. The feature helps keep track of all reservations. With Next Gen Dine, restaurants can place orders online, integrate with social media, offer rewards programs, sell gift cards and so much more. Next Gen Dine is the future of restaurant dining. For more information about the point of sale or to find out how your restaurant can take part of Next Gen Dine, contact Paul Roberts, Managing Partner, at 1-877-342-2218 or e-mail. Connect with us on Twitter, Facebook and LinkedIn. 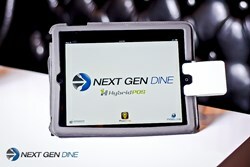 Next Gen Dine is a cloud-based, mobile restaurant point of sale soft ware designed for the iPad. Restaurant owners can now capitalize on the benefits of a full-featured POS system for a fraction of the cost of a traditional POS. Due to the mobility offered by the software, employees can take orders directly at the table, take credit card payments at the customer’s side, and drastically improve restaurant operating efficiency. Orders placed are sent directly to the appropriate prep station, therefore decreasing order turnaround time. Next Gen Dine also offers restaurant owners customer loyalty programs, gift card sales, social media integration, and many other fine-grained marketing tools.